Remember how I broke my wrist about 20 month ago? This time I broke my finger. Yep, playing hockey, again. This one is not as bad, I did not skate into a goal post or anything. I just happened to be blocking a shot. The puck hit me right on the fingers, essentially smashing my finger between the pick and my stick. I shoot left, so the fingers on my left hand are more 'exposed'. And yes, I was wearing a glove. I guess the shot was hard enough, or just hit the perfect spot, to smash my finger. 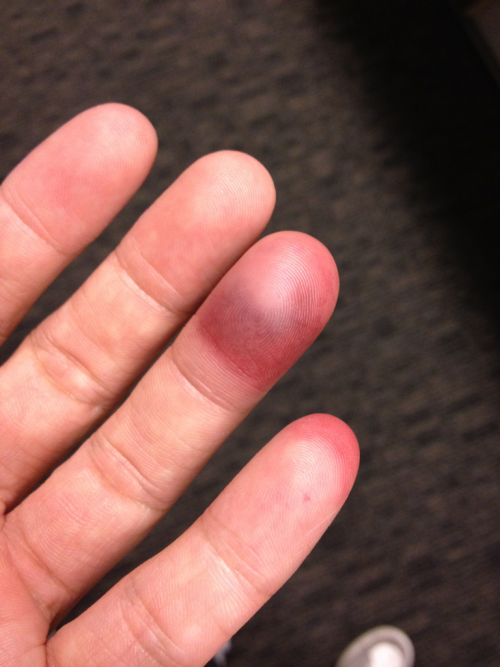 My fourth finger took the most of the impact, the fifth finger also sustained minor bruising. Oh, this happened in the first game of a double header that day. I still played the second game, but never got a shot on goal as there was discomfort...pain...in that area. That was 9 June 2012. I watched the bruise form and fingers swell up. Did not think anything of it at first. A week went by, bruising and swelling went down...yet the pain and discomfort was still there. I kinda had a feeling it was broken, but since I could move the joint, I just ignored it. Besides I had a DeLorean Convention to go to the next weekend. A doctor's appointment was scheduled when we got back from Orlando. The appointment was not until Monday. So naturally, I played the game on Saturday, 23 June. Why not? Hey, I even scored two amazing goals, including the game winner. Yesterday, I go see the same doctor, Dr. Steven Shin at Kerlan Jobe, that repaired my wrist. They already have my record on file and I know the doctor. Results, broken finger...achievement unlocked! Luckily, the impact was at the very tip of my fingers. If it had hit the joint, I would have needed surgery to repair joint damage. But if I was going to be cut open, I was at the right place as they service all the professional sports teams in the Los Angeles area. Dr. Shin tells me there was nothing they could do about the break. I knew that, not like they would put a cast on just the tip. He even cleared me to play hockey. 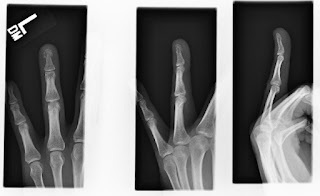 I just need to tape it up, which I did last game, so there is some support for the finger. I can feel the bone move when I bend my finger. I guess it has not quite fused yet. Dr Shin said to give it time, about four to six weeks, and it will be fine. On a side note: I may or may not have broken a rib. Although it has only been a few days, I still feel a little discomfort...pain...when I move my core. It even hurts a little when I take deep breaths or sit up too fast. It might be a bruise, but there are no signs of discolouration on the surface, nor is there any swelling.